Conceived from the perspective of the British, European and American travellers who visited Italy to experience antique, renaissance and baroque Rome during the period c.1650-1950, this intensive Study Programme will begin with a visit to the BRITISH SCHOOL AT ROME. This is a fine example of the work of Edwin Lutyens, built in 1911 in the Valle Giulia, Rome’s ‘Valley of the Academies’ and now a centre for research in archaeology, the arts and the humanities. The programme will consider palaces and villas with their collections in the light of papal patronage and focus upon some of the key Roman families and their influence upon their contemporaries. The choice of properties encompasses those that inspired travellers to collect sculpture, books, paintings and works of art, their taste informed by the desire to furnish and sometimes rebuild their town and country houses back home. The course will examine some of the most important Roman palaces still intact, including a number still in private hands, notably PALAZZO COLONNA, PALAZZO DORIA PAMPHILJ, GALLERIA PALLAVICINI and the CASINO DI VILLA BONCOMPAGNI LUDOVISI. The programme will also feature PALAZZO SPADA, PALAZZO NUOVO and the PALAZZO DEI CONSERVATORI, the historic home of the Capitoline Museums on the Capitoline Hill. 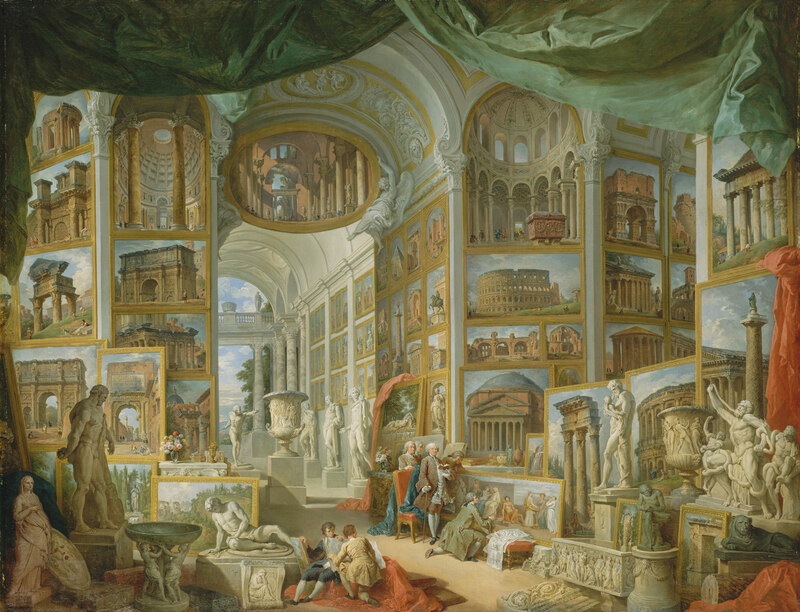 We shall focus upon the ALBANI COLLECTION both at the Capitoline and during a visit to the privately-owned VILLA ALBANI TORLONIA where we witness the collections, notably those of Cardinal Alessandro Albani, so central to the work of Winckelmann. The VILLA ADRIANA and VILLA D’ESTE at Tivoli and the Renaissance VILLA FARNESINA will enable members to witness the development of the Roman Villa. The course will then travel through the Roman Campagna to Naples, visiting en route the REGGIA DI CASERTA, built by the Bourbon kings. During a walking tour in the heart of the historic city we study the riches of the MUSEO DEL TESORO DI SAN GENNARO, PIO MONTE DELLA MISERICORDIA (home to Caravaggio’s Seven Works of Mercy) and the MUSEO CIVICO GAETANO FILANGIERI, housed in the fifteenth-century Palazzo Cuomo. The course will also visit the privately-owned VILLA LEONETTI overlooking the Bay of Naples and Pozzuoli and will study the Farnese sculptures in the MUSEO ARCHEOLOGICO NAZIONALE and the Farnese pictures at the MUSEO DI CAPODIMONTE. Visits to HERCULANEUM, the ROYAL PALACE OF PORTICI and VILLA CAMPOLIETO in the shadow of Vesuvius will complete this rigorous Attingham Grand Tour. The cost of this 9-day course is €3,700 (NB euros). This includes tuition, accommodation, most meals, admissions and travel by private coach. Airfares are not included. Single rooms will be available in both Rome and Naples on payment of a supplement of €540. Single rooms are not available to those receiving scholarship assistance, unless there is a specific medical reason. The deadline for applications is 12 February 2019. All candidates will be notified in mid March 2019. If awarded a place, an invoice will be sent and a deposit of €500 should be made at this time. The balance of fees is due, without further notice, by 12 April 2019. Participants are strongly advised to insure against cancellation as no refunds will be made following payment unless the place can be filled by another suitable candidate. In such a case, an administrative fee of €175 will be applied. It must be noted that this course is intensive and physically strenuous and that some specialist diets cannot always be catered for. The course fee, which includes the U.S. handling fee, is $5,280. A downloadable PDF form is now available from the American Friends of Attingham website. For any assistance please contact Mary Ellen Whitford, American Friends of Attingham, 205 Lexington Avenue, Suite 1600, New York, NY 10016, USA. Email: admin@americanfriendsofattingham.org; Tel: 001 (212) 682 6840. All candidates awarded full financial support either wholly from The Attingham Trust, or from/in combination with their institution or a separate funding body, are required to make a personal contribution of €175 to support the work of the Attingham Educational Charitable Trust. The Council of The Attingham Trust reserves the right to adjust fees if there is a substantial change in the exchange rate, as these were assessed on the basis of assumptions made in September 2018. Should this prove necessary, members will be informed by 8 April 2019. *For applications from Australia seeking scholarships, please refer to http://www.coplandfoundation.com.au before 15 November 2018.